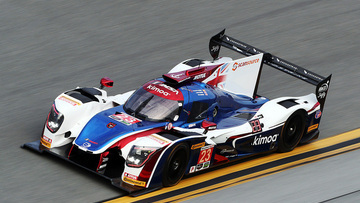 To say I was excited for the Roar Before the 24 is an understatement - it even made training over Christmas enjoyable. Aside from testing late last year, this was my first experience racing with the full United Autosport team, and it was great to be around the drivers - especially guys like Fernando who you can learn so much from. The chemistry in our car is great, obviously with Lando being my age we have the same sense of humour, which is balanced with Fernando’s maturity and experience. It’s been an amazing few days. On track, day one of testing was a pretty steep learning curve. The car has a new aero package and Continental tyres - which is completely alien to us in Europe, so it was a bit more tricky to find the optimal setup that we were looking for. Plus, it was the first time I’ve been to Daytona, so seeing the track and getting used to it was interesting. By the end of the test, we definitely had a good idea of what direction we’re going in as a team. We got in almost 1,500-miles of testing between the two cars which means the team have tonnes of data to analyse. I’m now heading home for an intense couple of weeks of training. I’ll be getting myself ready for the 24 hours, which is always tough physically and mentally, but this marks the start of the racing season so I can’t wait to get back in the Ligier. It’s a steep learning curve getting to grips with our new aero package combined with running on Continental rubber, a tyre which is completely alien to us in Europe, and in cold weather conditions. It’s a case of finding the key to unlock the performance but I’m sure we’ll ultimately get the sweet spot. The Speedway is incredible – the steepness of the banking is amazing – but I quickly adapted to it. I’m already counting down the days to coming back here for race week.